Discover the natural beauty of Cherokee County AL, Three River Realty at Weiss Lake for the home of your DREAMS or a Weiss Lake get-a-way, VIEW Real Estate Listings; mountain and waterfront property. Make 3 River Realty your 1st move! Our Community… what a gift! 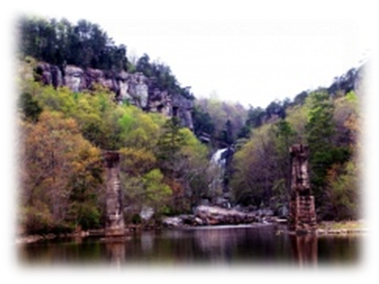 On the banks of Weiss Lake rest the County of Cherokee nestled in the foothills of the southern Appalachian mountains of northeast Alabama, our county offers small town characteristics, a friendly atmosphere and a natural beauty that is rarely found any where else. In fact, our residents enjoy the conveniences of larger surrounding cities with advantages that only a small town can provide. Come for a visit you’ll discover Cherokee is more than just a summer place. The focal of our community is Weiss Lake, locally proclaimed “Crappie Capitol of the World”. The lake occupies 30,200 acres, has 447 miles of shoreline with shallow flats, under water drop offs, deep channels and vast coves. A distinctive backdrop of Weiss Lake, Little River Canyon National Preserve, a true natural wonder offering world class rapids, impressive waterfalls, alluring caves and breathtaking mountain vistas. The beautiful uncharacteristic rock formations of historical Cherokee Rock Village with a rock climbing maze of passages and pathways that stunningly overlook Cherokee County. Just west of Weiss Lake is picturesque Yellow Creek Falls with its incredible 100′ drop and to the south is the, tranquil waters of Terrapin Creek, a terrific rocky bottomed stream habitat to several species of Bass, just swift enough to keep it interesting. Lake Weiss Living… the lifestyle you always imagined closer than you ever thought. Waterfront & Mountain Property, Homes, Lots & Land for sale. The BLUFFS overlooking Weiss Lake!
. All rights reserved . THREE RIVER REALTY, LLC . 3545 Cedar Bluff Road . Centre, Alabama 35960 . 256.927.3707 office . 877.927.3707 fax . Website content, information and images, are published as a service to site visitors for community educational purposes. Reproduction prohibited.